Figure 1. These colorful bacterial colonies were grown from bacteria present on human hands. The word bacteria often brings up negative connotations related to illness and disease. However, many bacteria are beneficial to humans and useful (even essential), as well. Biological, environmental and biochemical engineers must have a thorough understanding of bacteria in order to use these organisms in devising new treatments for diseases, better oil spill clean-up, and the production of alternative energy forms. Biochemical engineers genetically modify the DNA in bacteria to produce "designer proteins," and proteins to treat diseases, such as cancer or to act as new materials enabling the conversion of solar energy to useable electricity. Bacteria are also used by environmental engineers as an ecologically-friendly way to digest (literally, to eat ) the carbohydrates in oil from off-shore oil spills. Knowledge of the growth rates of bacteria is essential for these types of engineers in order to use the microorganisms in valuable ways for human and ecological life. Describe the potential positive and negative roles bacteria play in our lives. Determine, based on data analysis, the best way to keep bacteria off our hands. Plot data and determine their significance. Explain generally where bacteria can be found. Describe the conditions and requirements that bacteria need to survive. Have you ever noticed blobs of mold or strangely colored microorganisms around your house? These strange organisms might have shown up in suspicious looking food or in a pink ring around the water in a (dirty) toilet bowl. Well, microorganisms are all around us, and we can even study how quickly they grow. At the end of this activity, you will know what specific factors influence the growth of microorganisms, such as bacteria, and know what effects these various factors have on bacteria. People generally think that bacteria are bad for us or dirty, but in reality, many different types of bacteria are essential and beneficial to us. When we study bacteria closely, we find that they fascinating organisms. They have special features that make them ideal organisms for scientists and engineers to use in a wide ranage of applications ranging from medicine to environmental and energy engineering. One of these features is that bacteria grow very quickly. On average, bacteria reproduce every 20 minutes, which each bacterium does by splitting into two identical copies of the parent. That means that one bacterium turns into two, those two split into four, which then split into eight, and so on. If each split takes only 20 minutes, it does not take long before we have millions of bacteria. Scientists use this knowledge to their advantage to grow large quantities of these organisms for a variety of purposes. Another important feature of bacteria is that they do not need much to thrive: all they need for growth is air, water and a carbon source (such as sugar). Different strains of bacteria have adapted to survive in very harsh climates, such as high altitudes, deep in the ocean, and at very cold or hot temperatures. All of these features allow scientists and engineering to use them in a wide range of applications. Not only do these organisms affect the exterior and interior of our bodies, but bacteria such as E. coli are also used by biochemists and engineers to produce important proteins for therapeutic purposes through biosynthesis . Biosynthesis refers to the process by which cells, such as bacteria, put together simple molecules to make more complex ones. It is the process of biosynthesis that E. coli use to make new proteins that pharmaceutical companies then sell as treatments for various illnesses. Engineers also add bacteria to biofuel to create useable energy and remove waste from fermentation by-products while generating electricity. And, scientists and engineers modify different types of bacteria to act as clean-up agents for oil spills: the bacteria are able to break down oil compounds to simplify its removal from seas and oceans. This activity demonstrates that bacteria are found everywhere and that it is difficult to kill bacteria, even after washing our hands and applying antibacterial hand sanitizer. Using image processing software called ImageJ®, you will estimate how many bacteria collected from different surfaces grow over time. aerobic respiration: Respiration that requires oxygen. anaerobic respiration: Respiration that does not require oxygen. bacteria: A unicellular microorganism with no nucleus. colony: A visible cluster of bacteria. eukaryotic: A cell that has a nucleus. fission: One cell divides into two, which is how bacteria reproduce. photosynthesis: Converting light energy into chemical energy to fuel an organism's activities. prokaryotic: A cell that lacks a nucleus. Through this activity, students study three different conditions under which bacteria are found and compare the growth of the individual bacteria from each source: 1) an unwashed hand, 2) a hand washed with soap and water, and 3) a hand sanitized with antibacterial hand gel. Students take swab samples of one of their team member's hands under each of the three conditions and streak the swabs on Petri dishes containing agar gel, which supports bacterial growth. After a week, the three samples in Petri dishes show growth, giving students an opportunity to quantitatively compare the amount of bacteria growing from each test condition. 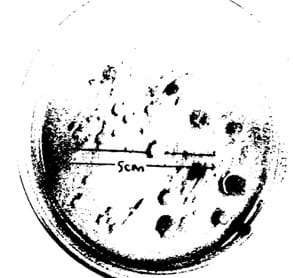 Quantitative analysis of these samples, via photographs taken of the Petri dishes at different time points, is conducted by analyzing the images through special imaging software. In addition to monitoring the quantity of bacteria from the different conditions, students also record the growth of bacteria over time, which is an excellent tool to study binary fission and the reproduction of unicellular organisms. Bacteria are unicellular organisms that reproduce by a process called binary fission , meaning that each singular bacterium splits into two after its genetic material is duplicated. This method of replication is asexual, since the bacterium does not need a partner's genetic material to be able to reproduce. Bacteria are prokaryotic organisms, which mean they are cells that have no nucleus. The time it takes for bacteria to complete binary fission, on average, is 20 minutes. In order to grow, bacteria need three things: water, air and a carbon source (sugar, for example). Most bacteria have optimal growth at a temperature of 37 °C, or 98.6 °F (the temperature of a healthy human body). Bacteria can grow in a wide range of different environments, and since they do not carry out photosynthesis , they can grow with or without sunlight. Shine a light through a liquid media with bacteria growing, and measure how much light is scattered by the sample. More scattering means more bacteria. Use a cell counter, which uses software connected to a microscope, to look at a sample of media with bacteria. The software counts the number of bacteria. Gather materials and make copies of the worksheets and pre/post assessments. Label three Petri dishes for each group by using a marker to write the group number/name and class on the lids. Also, clearly mark the following on each of the three lids: unwashed, washed, sanitized. Figure 2. 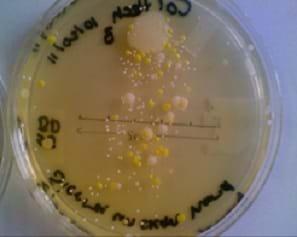 Students streak plates with sample bacteria found on their hands. Instruct students to choose one student in each group for each of the following roles: Sample Student (provides the hand samples), Swabber (collects the swabbing samples), the Supervisor (makes sure the correct Petri dish is being used) and the Washer (oversees the washing and sanitizing of the sample student's second hand). Note: To reduce experimental error, it is important to have all samples come from the same person. Hand out three pre-labeled Petri dishes to each group; ask students to notice how each lid is labeled. 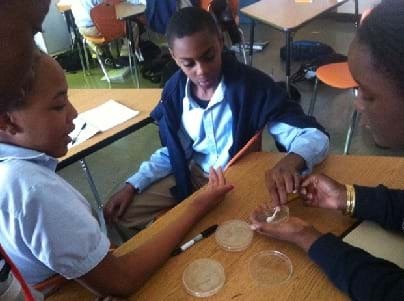 Direct students to begin with the "unwashed" Petri dish. From the Sample Student, a second group member, the Swabber, should gently rub a cotton swab on the surface of that student's palm. Be sure the Swabber does not lay down the cotton swab. The Supervisor, a third group member, should open the "unwashed" Petri dish containing agar. The Swabber should gently rub the cotton swab sample taken from the unwashed hand back and forth on the agar. Remind Swabbers to be very careful not to apply too much pressure when doing this, so as to not tear the agar. The Supervisor should close the Petri dish. The Swabber and Supervisor should repeat steps 4-6 for this hand; being careful to streak the dish labeled "washed." Finally, the Washer should apply hand sanitizer to the Sample Student's other hand (the hand that was not washed in the previous step). Allow the hand to air dry until all gel has evaporated. Instruct students to repeat Steps 4-6 for this hand, except being careful to streak the plate labeled "sanitized" this time. If computing resources are limited, collect the data and demonstrate to the class how this part of the activity is done. If computing resources permit, and students are able to process the images themselves, present the following ImageJ® instructions to them. Take a photo of each plate approximately four days after streaking. Save each file to your computer, naming it descriptively (such as, "unwashed_day4.jpg" or "sanitized_day5.jpg"). Figure 3. ImageJ® analyzes the size of the circular black particles (colonies) and expresses it as a fraction of the area analyzed. Select File > Open from the drop down menu. Select the image file to be analyzed. Trace a line over your scale bar. Select Analyze > Set scale. Fill in the "Known distance" box for the length of your scale bar, and set the "Units." Tracing the line over the scale bar tells ImageJ® how many pixels correspond to a given distance (the length of your scale bar). This enables the software to determine the size, and hence area, of different features that appear in your image. Click Image > Adjust > Threshold. For the Threshold Color, select B&W . Adjust the Hue, Saturation, and Brightness levels until you obtain your bacterial colonies in black and the background agar in white. From the toolbar, select the "Circle" image. Draw a circle around the edge of the Petri dish to define the precise area from which the software will measure the bacteria. Next, from the Analyze menu, select "Analyze Particles." Set "upper limit" size to 4 cm 2 (generally bacterial colonies would not be larger than 4 cm 2 ). "Circularity" should be 0-1 , and select Nothing from the "Show" drop down menu. Select "Summarize" from the checklist. Click OK . The Summary window opens and provides data on the area of the Petri dish that is covered in bacterial colonies. This data is found under the column "Total Area," and is given in square units of what you entered in step 5. The Summary window also displays the "Area fraction." Students may record the area fraction (given as a % of the total area measured) and use this as their data for the amount of the Petri dish covered by bacteria. If you chose, you can save the adjusted photo by File > Save As > "new name." As soon as the plates have been streaked and the Petri dish lid replaced, apply two pieces of tape to keep the lids connected; however any closure should not be made air-tight. Keep the Petri dish plates away from students until the time of data analysis. No student, at any time, should touch the agar or the bacteria . When taking pictures, open the lid briefly and replaced it immediately. When the activity is complete and pictures have been taken of all samples, immediately discard the Petri dishes in a trash container that is securely away from the student population. Pre-Activity Survey – Instruct students to individually complete Pre-Assessment Bacteria Survey s. Review their answers to gauge their comprehension. Worksheet – Have students use the Where's My Bacteria? Worksheet to guide the activity. They should work on the worksheets within their groups only, no sharing of answers across groups. And, each student should complete his/her own worksheet. Review their data, graphs and answers to gauge their mastery of the subject matter. Post-Activity Survey – Instruct students to individually complete Post-Assessment Bacteria Survey s. Review their answers to gauge their depth of comprehension. For lower grades, omit analysis of the images and simply examine the bacterial growth by eye. Compare the three samples to each other to obtain a relative quantization of the amount of bacterial growth in the Petri dishes. For upper grades, take images of the samples more frequently for quantifiying and plotting. Expect the resulting plots to show an exponential growth of bacteria over time. Mathematically fit the data exponential curves and perform regression to determine how closely the experimental data matches the theoretical predictions.